Winco WDM009-201 Ardesia Linza White Melamine Square Mini Bowl 2-1/2"
TigerChef > Dinnerware > Melamine Dinnerware > Melamine Serveware > Melamine Bowls >< Square Bowls > Winco WDM009-201 Ardesia Linza White Melamine Square Mini Bowl 2-1/2"
✔ 2 oz. capacity✔ Color: white✔ Break-resistant, highly durable✔ Dimensions: 2 1/2"
$90.56 Winco WDM009-205 Ardesia Linza White Melamine Square Bowl 10"
$66.99 Thunder Group PS3111W Passion White Square Melamine Bowl 128 oz. - 1/2 doz. $32.99 Thunder Group PS5006W Passion White Square Melamine Bowl 23 oz. - 1 doz. Use the Winco WDM009-201 Ardesia Linza White Melamine Square Mini Bowl 2-1/2" for serving dips, sauces, and other condiments. Designed with a smooth surface and a pristine white shade, this mini bowl beautifully frames food while easily complementing any dinnerware collection. Perfect for both indoor and outdoor use, this professional quality serveware combines the delicate look of ceramic with the exceptional durability and break-resistance of melamine. 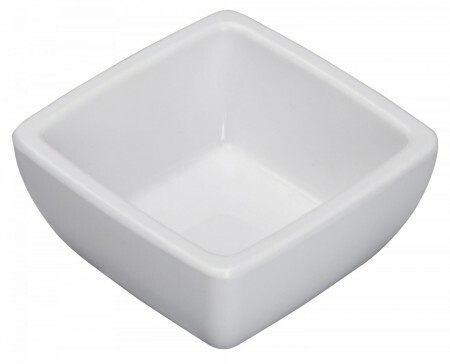 A functional and stylish option, this square mini bowl is also perfect for serving individual, sample servings.